The Optical Foundation was all geared up for its first project in Gambia which, as one of the poorest countries in Africa, has an extreme shortage of eye care specialists. Teamed up with the Dutch foundation ‘Stichting Zienderogen Nederland’, our volunteers were all prepped and ready to take on this challenge when the project had to be cancelled due to the unstable political situation after the December 2016 elections in Gambia. 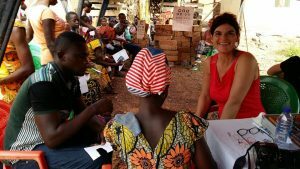 Our volunteers’ safety was our first priority, so the decision was made to divert the support to an alternative eye examinations project in Ghana instead. We teamed up our four volunteers with Sister Aba and her team for the project in Ghana. Sister Aba is the founder of the Jachie Eye Clinic, which provides exceptional eye care in the Ashanti region through the clinic and its outreach programs. 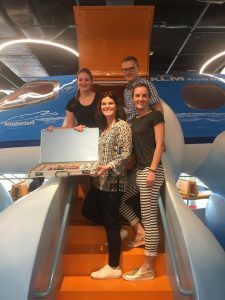 Preparing for the project, the team had been in contact via email and had met once in person prior to flying out of Schiphol airport (Amsterdam) on February 17th. Equipped with a case with slides, an auto refractometer, a tonometer, a mirror, a retinoscope, two vision cards, as well as a large suitcase full of small frames, ready-made reading glasses and sunglasses, they set off on their journey. They flew into Accra (the capital of Ghana) late that evening, so they had to spend the night in Accra, before catching the bus for a 4.5 hour ride to Kumasi the next morning. On arrival in Kumasi, they were picked up by Sister Aba and were taken to the monastery in the village of Jachie, which would be their accommodation for the duration of the project. They were each given their own room and every day they would share breakfast and dinner together in the dining room. Every morning around 7.30-8.00 our volunteers would get picked from the monastery. Then the driver would pick up Sister Aba’s outreach team of 6 at the clinic before setting off to the day’s screening destination (mainly schools). The outreach team was made up of an optometrist, student optometrist, 2 student opticians, and 2 administrative assistants. On arrival at the screening sight, the team would first find a suitable spot (in the shade) where they would be able to perform vision checks and refraction and they would also need to find a dark room where the retina could be examined. Sjieuwke and Vera were teamed together and Ellen worked with Frank (a student optician), both teams performed refractions where necessary. James (a student optician) helped translate as not all patients spoke and/or understood English. Refraction was performed when a patient did not get a binocular visual acuity of 1.0 or higher, monocular visual acuity of <0.8 or at age 35+ for possible addition determination. Johan was teamed up with Richmond (a 5th year optometry student) and Bright (an optometrist) for retinal assessment. A big focus was on signs/indicators for glaucoma as this is a very common eye disorder in Ghana and a leading cause of blindness. If diagnosed on time, glaucoma can be treated. The other students would help explaining to the patients how to fill in personal details on the data form and on how to take the visual acuity using the landolt C or an illiterate E card. The administrative staff would take the research forms of the study at the end and keep track of which patients had to go for further checks at the clinic and which patients had no issues. With the exception of the screening day at Ateiku, most screening days would usually go till 14:00-15:00, as the schools close at 14:00. Although they weren’t exceptionally long days, the extreme heat and the large number of people being screened made the task at hand very exhausting. Over the course of 3 days since arriving in Ghana, our volunteers had screened 624 people (of which 500 were children). Relatively few children needed glasses compared to the number of cases of suspected glaucoma. Below is an overview of the number of patients screened and how many were referred to the clinic (with suspected glaucoma, cataracts, refractive disorders or cycloplegic refraction). Getting to Ateiku (in the Western Region) took a 3.5 hour bumpy ride over dirt roads. On arrival in the village there were already a lot of people waiting for our volunteers, mainly adults. Having established a routine with the previous days of screening, the team quickly set up and commenced screening. When performing the visual acuity and the refraction, it pretty soon became apparent that many people had cataracts, corneal dystrophies or other eye diseases, and many of these patients only had a maximum vision of 0.12. Fundus screening was a huge task in itself. A makeshift tent was meant to create a darkened room, but the daylight conditions made it very challenging to screen the narrow pupils and eyes that often had blurry vision. Some patients were referred to the hospital for surgery (when a patient doesn’t have money for this, Sister Aba pays for the operation of one eye, so that they can at least see something, and if the operation is successful the family can collect money for an operation of the other eye). Most of the 120 patients screened couldn’t speak English and someone would help translate during the screenings. Also it was very confronting to see that many of these adults were illiterate. At times it was very disheartening for our volunteers because early detection of some of these eye conditions could have made all the difference but now there was very little they could do for some of these people (who had had their hopes up that our volunteers could do something to fix their conditions). After a long day of screenings in the intense heat, the return trip to Jachie took 4.5 hours, with our volunteers reaching the monastery at 23.30. Although it was a very taxing day, from a professional perspective this practical exposure was an exceptionally educational experience. 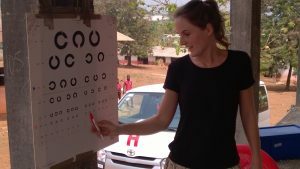 After their last screening day, our volunteer team went to the School of Optometry at the University of Kumasi. They were given a tour of the school and the clinic, and were introduced to the students in their 5th year of study. 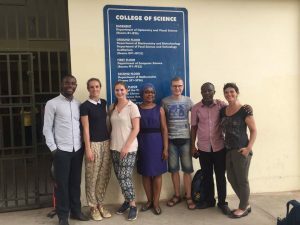 There is no Orthoptics education in Ghana so our Orthoptist volunteers gave a lecture on the subject, which was greatly received by the students. On behalf of Stichting Zienderogen, our team of volunteers donated a large suitcase full of small frames, ready-made reading glasses and sunglasses, to the Jachie Eye Clinic. Vera van Uum, Sjieuwke Koorevaar, Johan Franken and Ellen Blom made up the team of volunteers, who took time away from their family and friends, their jobs, studies and social environments to make eye care accessible for some of the poorest communities in Ghana (and especially the children).